Chelsea Interim coach Rafa Benitez did not made no apologies for his comments about Chelsea's supporters on Wednesday night as he took part in his first press conference since then. However, the former Liverpool manage insisted he still wanted the fans to back him and the team and that he had no regrets about taking the role at Stamford Bridge. Benitez also denied he had wanted to take the Chelsea job on beyond the summer, saying that all he was desired was to stay at the club until his contract ended and not become 'a distraction'. When asked about unrest at Stamford Bridge because of his remarks about the club's decision to make his title 'interim' manager he said: 'I do not have any problem with the board, Michael Emenalo, Roman Abramovich, the players. 'What I want to do is the best for the team, the best for the club. 'I have been for 26 years training and coaching and always I have had principles, respect and education. 'It's the way that I have achieved what I've achieved. We have 11 games to play. If we stick together, it will be easier and we can get more points. 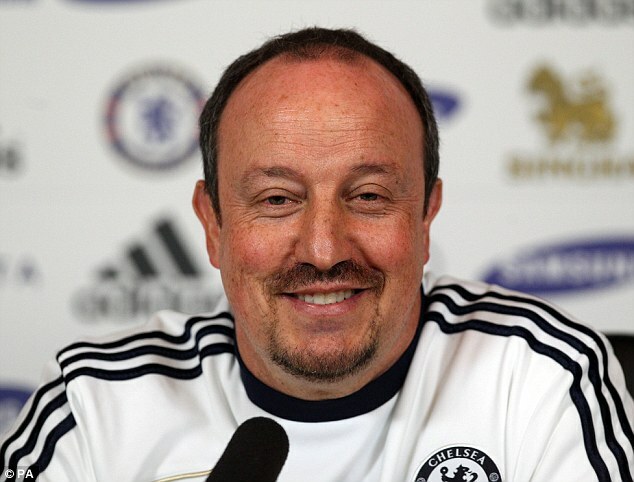 Benitez refused to confirm if he had been spoken to by Roman Abramovich after his comments and said they were designed to get the fans to back the team instead of chant about him. 'The message was very clear. Together, it will be easier to win games to get points, to be in the top four, top three, or maybe top two,' he said. Following Wednesday's FA Cup win at Middlesbrough, Benitez said the decision to appoint him as 'interim manager' was 'a mistake', but now said 'it's not an issue'. 'I said before... One thing's a mistake. Another's an issue. Now it's not an issue. Benitez said he hoped the fans would recreate the atmosphere that saw Chelsea beat Napoli during their Champions League run last season, and also the Arsenal game from earlier in the season.